“Marie Kondo”, “Spark joy” and “KonMari method”. These are the few terms you might have heard over the past few weeks, with the internet abuzz with chatter about the Japanese organising consultant and author Marie Kondo and her Netflix series “Tidying Up With Marie Kondo“. Domino’s Pizza has once again proven itself to be at the forefront of trendjacking, using Kondo as an inspiration to promote its weekly Super Tuesday pizza deal. 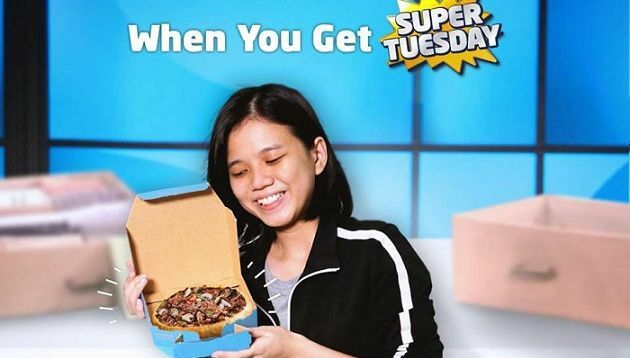 The pizza chain posted a picture on Facebook of a female holding a box of personal pizza while smiling, with the words “When you get Super Tuesday and it sparks joy”. In the caption, it also urged consumers to pursue joy and happiness with its Super Tuesday pizza deal. The posting was a collaborative effort between Domino’s and social media agency 16Two. Senior VP of marketing, Malaysia and Singapore, Linda Hassan said in a statement to A+M that Kondo’s series on Netflix has truly inspired many consumers ahead of the festive season. Referencing her infamous line of ‘Does it spark joy?’ that has gone viral on the internet, the company’s intent was to marry the idea of only keeping things that spark joy with its own Super Tuesday weekly pizza deal. Additionally, in line with its brand promise of “It’s All About You”, it also wanted to remind customers to take a break and treat themselves after all the busy preparations and tidying up for the New Year. “As one of the most emotionally connected brands in Malaysia, we strive deliver joy and happiness in many forms be it through our pizzas or our social media postings – all to add that extra spark of Domino’s experience to our customers,” Linda said. In a separate interview with A+M previously, Linda said the brand love that Domino’s has been advocating is strong within, as her team loves and believes in the Domino’s brand. She encourages them to be less rigid and explore more ways to build brand relevance and love among consumers. This includes the type of content it creates to draw consumers to Domino’s and engage with it. “They may not buy from us now, but in order to build that brand love, consumers need to first know that brand so we are taking that route first,” she said. Being a client is tough, says the Health Promotion Board's director of corporate marketing and communications Vernon Vasu as he ex..
WPP’s programmatic media platform Xaxis has named Andy Chung as managing director of Hong Kong. ..